Whether you are topping a salad or eating straight from the bag, sunflower seeds are a great snack. What if we told you that sunflower seeds can do more than curb your hunger? Those little seeds pack a punch when it comes to overall health. You may be surprised at just how helpful sunflower seeds may be. Here's why you should be eating more of them. According to the Global Healing Center, sunflower seeds can be good for your cardiovascular system. These seeds have two critical nutrients needed for heart health: vitamin E and folate. Vitamin E has an antioxidant function and if regularly consumed may reduce the chances of heart disease. Elevated levels of homocysteine in the body can be an early indication of heart issues, but folate works to metabolize homocysteine into methionine, which is an essential amino acid. Who couldn’t use a boost to their mood? Sunflower seeds are high in magnesium, which has been proven to help people who suffer from depression, according to the Global Healing Center. Sunflower seeds contain high levels of phytosterols, which have properties similar to cholesterol. Research has linked the phytosterols in nuts in the diet to healthy levels of cholesterol in the body. Sunflower seeds may be able to help you get healthier and more vibrant hair and skin. An article on Dr. Axe says that the essential fatty acids coupled with the high levels of vitamin E help protect your skin and hair from sun damage and promote healing. More energy may seem like only a dream, but sunflower seeds can make that dream come true. An article on SFGate Healthy Eating describes the energy-boosting properties found in the delicious seeds. Vitamin B-1 (thiamine), found in abundance in sunflower seeds, helps you obtain more energy from food sources and activates chemical reactions in your cells that your body needs to function. Healthy circulation is important especially when it comes to blood pressure and cardiovascular health. 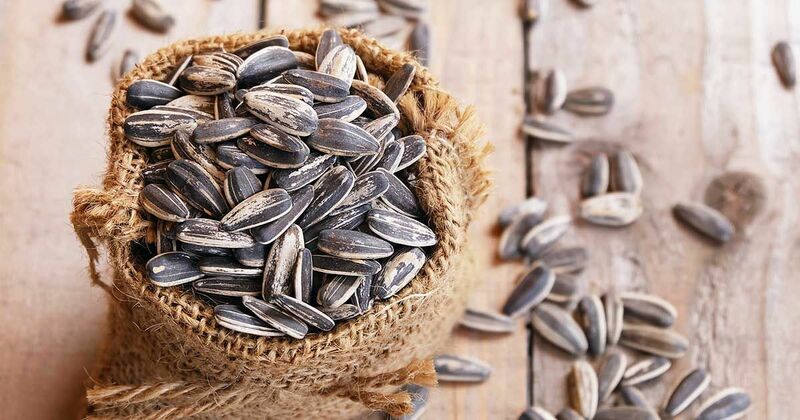 The high levels of magnesium in sunflower seeds help maintain a healthy circulation, thus helping ward off several potentially serious illnesses and health concerns. 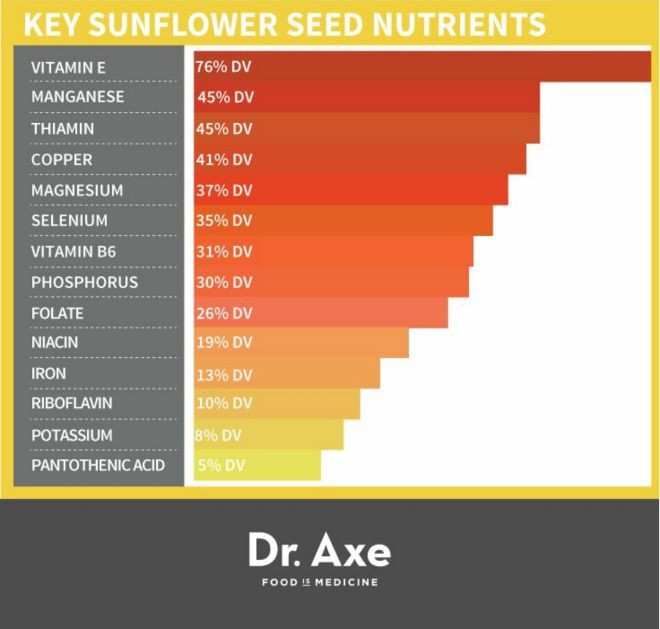 Dr. Axe describes how sunflower seeds may be able to help prevent cancer. It is proven that oxidative stress can increase the chances of cancer. How do sunflowers play a role in prevention? The minerals, vitamins and antioxidants found in the seeds help reduce oxidative stress from consuming the body. This can help slow the growth of cancer cells and repair DNA. Thyroid issues are all too common. A leading cause of thyroid problems is associated with selenium deficiency. Sunflower seeds are an excellent source of mineral selenium. Eating a few handfuls a day can help lower your risk of selenium deficiency. As you get older, bone health becomes a serious concern. According to The World's Healthiest Foods, the high levels of magnesium found in sunflower seeds help regulate the calcium/potassium intake, which in turn helps battle against osteoporosis, bone loss and muscle cramps. The nutrients found in sunflower seeds work to level the peaks and valleys associated with sugar-enriched diets. This can reduce the chances of diabetes. The high amounts of vitamins and minerals found in sunflower seeds work to bolster the immune system. Feeling a little under the weather? A few seeds can go a long way toward reducing your chances of contracting common colds and other seasonal sicknesses. According to The World’s Healthiest Foods, the vitamin E found in sunflower seeds proves beneficial for battling anti-inflammatory issues such as asthma, osteoarthritis, rheumatoid arthritis and other conditions. Vitamin E works to stabilize radicals throughout the body and protect cellular and molecular components that are at risk for inflammation. After a long day of working or playing, your muscles could use a break. Calcium works to protect and rejuvenate bones, but if calcium rushes to the muscles, it can cause aches and pains. Magnesium, found in sunflower seeds, actually slows the processing of calcium, which in turn leads to relaxed muscles. Did you learn a thing or two about sunflower seeds? We thought so! Be sure to share with your friends.